As the RNC winds down its efforts supporting Donald Trump—cutting off the Trump ‘Victory’ project in light of newly released audio of the Republican presidential candidate making lewd, chauvinistic comments—it is becoming clear that Hillary Clinton is America’s likely 45th president. Though her lead in the polls is slim, it is consistent, so it is worth looking into how a President Clinton might govern. Luckily, Wikileaks made that line of inquiry easy, releasing the long-awaited transcripts of her paid private speeches. Besides showing the Democratic presidential candidate taking positions inconsistent with those she has been running on, they offer other key insights. In one speech, Clinton stressed the importance of having a both a ‘public’ and ‘private position.’ During the primary Clinton sought to align herself publicly with populist messages of Bernie Sanders. 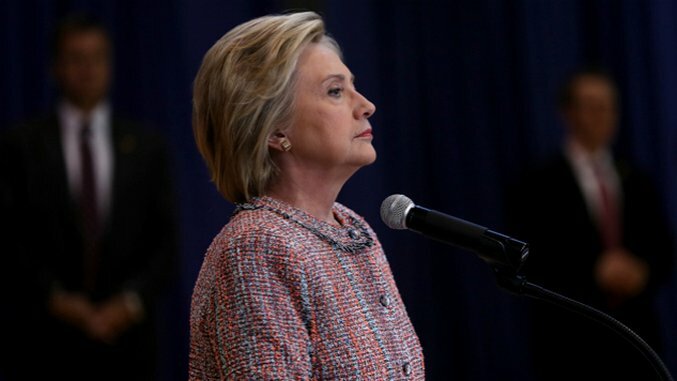 In June she declared, “I will fight hard to end the stranglehold that the wealthy and special interests have on so much of our government.” Private Clinton—the one from the speeches—does not appear to hold this view. Remember what Teddy Roosevelt did. Yes, he took on what he saw as the excesses in the economy, but he also stood against the excesses in politics. He didn’t want to unleash a lot of nationalist, populistic reaction. He wanted to try to figure out how to get back into that balance that has served America so well over our entire nationhood. Today, there’s more that can and should be done that really has to come from the industry itself, and how we can strengthen our economy, create more jobs at a time where that’s increasingly challenging, to get back to Teddy Roosevelt’s square deal. From these remarks, it is clear that progressives under the Sanders umbrella were right all along: President Clinton would be a status quo candidate. She would govern as President Obama has, largely through administrative agencies rather than by pushing sweeping legislation through Congress. Under this approach, the legislature cedes some of its rulemaking authority to the executive branch. The president is then able to act without Congress, filling in the nuts and bolts regulation, and enforcing it. This allows representatives to be seen taking popular policy positions while insulating themselves from political backlash with their donors over implementation. It is a win-win—especially now that our Congressional representatives spend half of their time fundraising. But, as everyone knows, the status quo has had limited success in curbing the abuses of major industries. On its own, it has done little to effect change, and this futility has prompted the rise of economic populism. In spite of the threat of millions of dollars in fines, Wall Street banks—which are bigger than ever, and worth billions—still engage in many of the risky practices that led to the Subprime Mortgage Crisis. The forming auto loan bubble is particularly troubling. The first problem is procedural. Whereas prior to the 1980’s and especially the 90’s, administrative agencies were free to make rules themselves, now the process is complicated, albeit standardized. When an agency proposes a rule, it must first go through review by the Office of Informative and Regulatory Affairs, which conducts a regulatory impact analysis, including the costs and benefits, as well as an assessment of alternatives. Then, it goes through what is known as “notice and comment,” wherein the public has the ability to weigh in. Anything objectionable will then have to be justified by the agency, which can complicate an already complicated process, and open the door for industries to influence the rules they are governed by. Authors Note: If you think this seems like a lot of hurdles meant to hinder the regulatory ability of the administrative state, you’d have a strong case. While “private Hillary” finds industry influence beneficial, Democrats have been distancing themselves from the self-regulation narrative in light of events like the BP Deepwater Horizon explosion, and the Subprime Crisis. But by far the biggest downside of the administrative approach is that agencies are extremely subject to regulatory capture (the ‘revolving door; is a very real problem), and their rules are impermanent. Those nuts and bolts discussed earlier are not binding on subsequent presidential administrations, and can be changed with no check from Congress. The Dodd-Frank banking reform bill, which Clinton accurately (though it is a low bar) touted as “the most consequential financial reforms since the Great Depression,” in an interview with the NY Daily News editorial board, suffers from these pitfalls. The Volcker Rule, for example, has yet to be implemented, and even if that were to happen, the next president can still tweak or even abandon it. That Hillary Clinton would choose to govern in this way is unsurprising given her relationship with major industry. Private Clinton fawns over those who funded her campaign and made her ‘a small fortune.’ She assures her donors, or those who pay for speeches, that her public persona is different from what she really believes. And what she really believes is that the Subprime Mortgage Crisis is far more complex than the popular narrative blaming Wall Street, and there is a bias against “successful” individuals working in government. The question that remains is what effect, if any, a corporate-friendly President Clinton will have on the Democratic Party. It was Woodrow Wilson who established the president as party leader, but this year could change that entire system. Although there has been a push among Democratic lawmakers, emboldened by Clinton’s nomination, to welcome big money with open arms, Clinton’s mantra of ‘that’s just politics’ has already met opposition from two prominent progressives with higher approval ratings than she. Senator Elizabeth Warren, along with Sanders, have joined forces, and already declared their intentions to stand as a check against corporate influence in her administration. If the status quo persists, populist fervor fueling the rise of progressivism on the left and Trumpism on the right will not subside. For Clinton, that could mean losing control of her own party. And that could set an interesting precedent indeed.